Well it’s Neo Nectar’s turn, and then we scrape the barrel until Link Joker gets a turn in December. Starting us off is…a G Guardian that generally isn’t going to be useful. I mean, putting two dead normal units back? Musketeers don’t really appreciate it when they want to thin a deck, Maiden of decks have better things to do, and Ahsha already has so many other things that does this card’s job. The reusable aspect of this card is the only real reason to use it but even then, you use a G Guardian for meaty shields, and this won’t give you that. 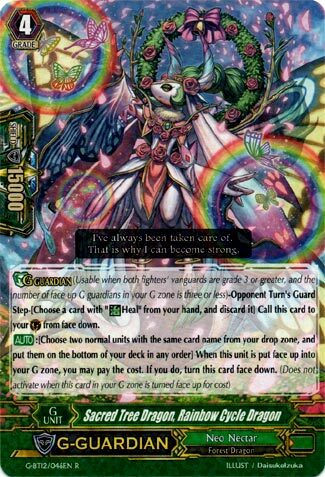 Here we have another resource that allows Neo Nectar to reload its deck with more units to copy and bring out for their Bloom abilities. Not bad, but the clan already has some nice options for filling that niche and the lack of any kind of additional shield gain on this unit certainly hurts as well. Useful in a pinch if you desperately need a way to refuel your deck, but I don’t see this being used in any deck as more than a 1-of tech.